When you want the best, waiting 40 years to see it doesn’t seem like such a big deal. That’s how long it took rock legends Kiss to make it to Victoria for a concert. And fans seemed overjoyed at their arrival. A soldout crowd of 6,597 had what appeared to be a hell of a good time. The band? Well, they had some rough spots. But in the end, Friday night’s event at the Save-on-Foods Memorial Centre had everything that is worth waiting decades for, multiplied by a factor of 666. Pyro, LED lights, giant video screens, and an eight-legged spider stage — reportedly the biggest of Kiss’s career — topped out the visual portion of the concert. Add to that a collection of hits — not to mention flying band members — and there’s no stopping a juggernaut like this when it gets on a roll. It even had fire, blood, concussion bombs, confetti cannons, and a smashed guitar for good measure. Fans came to the table prepared. Plenty in the audience were dressed in full Kiss garb, the remainder standing for the entire set. They did their half, and Kiss did theirs. The group made up for four decades of lost time with a spectacle of lights cameras, and action right out of the gate. I could have used less second-rate tricks that ate up time and a few more hits like Strutter, Calling Dr. Love, and Plaster Caster. But that’s being unnecessary critical. The setlist of 17 songs, on paper, is a short set. But it was full of life. The band opened with Psycho Circus, which worked out the opening-night kinks. Kiss hit its stride quickly thereafter. Shout it Out Loud, a standout from 1976’s Destroyer, saw the band pull out all the stops, with singer guitarist Paul Stanley dropping to knees in dramatic fashion, bassist Gene Simmons wag his serpentine-like tongue, drummer Eric Singer work magic on his snare drum, and guitarist Tommy Thayer pull off the song’s instantly recognizable solo. It only got bigger and more over the over-top from there. Visually, what Kiss offered is unmatched in Victoria history. Simmons and Stanley were equal partners in this game. The bassist handled I Love it Loud, War Machine (during which he spit fire), and God of Thunder (which saw him spit blood), while the guitarist commandeered Heaven’s On Fire, Lick it Up, and I Was Made For Lovin’ You. The two co-founders split singing duties on Shout it Out Loud, among others. Most fans wouldn’t have it any other way. Well, to be fair, given that Thayer handled former guitarist Ace Frehley’s Shock Me, some would have been happy to hear Singer tackle former drummer Peter Criss’ hit, Beth. 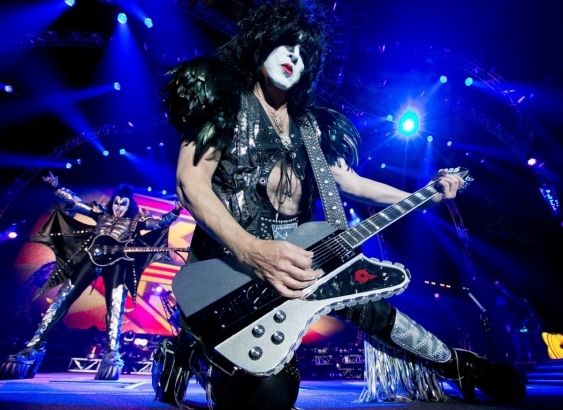 Kiss has long been known for its stage antics, the entirety of which were pulled out during the first date on the North American leg of the Monster tour. Good for them, and good for us. Better 40 years late than never. Florida rockers Shinedown opened the night with a 45-minute set of radio-friendly hard rock. The band’s first few songs were to a half-full house, an unfortunate set of circumstances dictated by the hefty entry line-ups that stretched outside when they took the stage at 7:45 p.m.
Shinedown recovered quickly. They plenty of room to move, which helped matters — not every opening act gets nearly full use of the stage and lights — and the sound quality was extra-solid. Though some might consider it a backhanded compliment — which it isn’t — the set had plenty of Nickelback in its veins. Save Me, its big, melodic-rock hit, proved that in spades. Frontman Brent Smith belted it out for the duration, with tonnes of tech behind him. The band looked, sounded, and played great, its version of Lynyrd Skynyrds Simple Man proving to be the highlight.